In the state of Utah, there is a low rate of alcohol abuse when compared to other states. According to the Substance Abuse and Mental Health Services Administration, roughly 31 percent of state residents drink alcohol and about 16 percent binge drink. Even though the rate of alcohol abuse is relatively low, it can be a concern when a loved one starts to drink heavily. Fortunately, there are 12-step programs available that provide the tools that individuals need to avoid alcohol abuse and focus on personal recovery goals. A 12-step program refers to any plan of action that follows the traditional 12-step treatment programs. It directly confronts alcohol abuse by admitting that there is a problem and then focuses on raising self-awareness so that individuals can reach their recovery goals. Psych Central explains that the program works on making changes to the individual’s behavior and actions so that they are no longer abusing alcohol. It also surrenders to a higher power, which means that the treatment plan is a faith-based option. Essentially, a 12-step program takes different steps and actions to change behavior, raise awareness of personal actions and admit that there is a problem so that it is possible to address the situation. The faith-based approach also helps by providing support and recognizing that help is available when it is necessary. Alcohol abuse and addiction is often complicated, so it is important to find an effective treatment program. Although a faith-based treatment plan is not the best option for every individual, a 12-step program is proven to have positive effects. According to the Journal of Substance Abuse Treatment, individuals who actively participate in the 12-step program and related activities have a lower rate of alcohol abuse after two years when compared to individuals who did not participate in the activities and treatment program. Since the study shows two years of abstinence and sobriety, it suggests that the program is an effective option to help with recovery. A 12-step program is supportive and provides a mentor to help individuals when alcohol abuse is tempting. The healthy support system ensures that an individual has the help available when there are challenges or a stressful situation arises. By asking for help from others or a higher power, the treatment program ensures that an individual is not alone and will not need to face challenges without assistance. 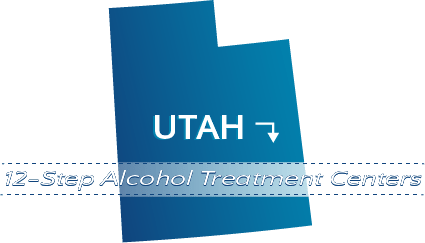 There are a variety of treatment programs in Utah that offer a 12-step approach to alcohol recovery. The programs offer treatments that can address complications, like mental health disorders, so that it is possible to obtain personal goals. New Horizons NCS is a treatment program in Ogden that offers out-patient care and solutions for mental health disorders. Since a mental health disorder can contribute to an alcohol addiction, the treatment program strives to address complications that can arise when alcohol is no longer being abused. It offers 12-step meetings to help with recovery and takes a long-term approach to healing. When individuals need a structured environment, the Ogden Regional Medical Center ACT can help. The treatment program offers residential services to help with addiction recovery and provides an out-patient program when individuals have completed the initial treatment. The program also provides 12-step meetings for long-term goals and starts the treatment with a 12-step approach during the residential program. Davis Behavioral Health Inc Intensive Outpatient is a treatment program in Layton that provides out-patient treatment services and 12-step meetings to help with the recovery process. Since the program is an out-patient option, treatments work around a personal schedule and obligations to ensure that treatment is available. There are a variety of treatment programs that can help with recovery in Utah. AlcoholTreatment.net can help individuals find the right 12-step treatment program for their goals based on the current situation and the complications that may arise.